Environmental protection in West and Central Africa is essential to achieving the Sustainable Development Goals (SDGs). Ecosystems are under pressure in the Sahel region, which is manifested by environmental degradation such as shrinking of lake Chad, crop failures as a result of shifting rain patterns and extreme weather socks affecting already vulnerable populations. Protecting the mangrove in Ziguinchor, Senegal. UN Volunteers assigned to UN entities such as the United Nations Development Programme (UNDP) and the United Nations Multidimensional Integrated Stabilization Mission in the Central African Republic (MINUSCA), play important roles, advocating for improvements in environmental management and engaging communities to protect the ecosystem. In 2017, 266 UN Volunteers in West and Central Africa, or 17 per cent of all volunteers deployed in the region, served in assignments linked to environmental issues. UN volunteers with assignments linked to environmental issues, for example in Senegal, Liberia and the Central African Republic, are committed to improving the living conditions of the population through outreach programs or environmental protection or clean-up activities. In the Central African Republic, three very energetic UN Volunteers work in the Environment Unit of the UN Peacekeeping Mission MINUSCA. They bring many years of environmental experience to the team. As part of Earth Day on 22 April, UN Volunteer Sahon Flan and her colleagues participated in clean-up and tree-planting activities organized by the MINUSCA in a school located in the 7th district of Bangui. An activity in the college “Etat des Rapides” mobilized students, MINUSCA peacekeepers and the local community, who worked together to remove plastic waste and planting trees. Mamadou Lamine Coly (Senegal), UN Volunteer Forestry and Environment Engineer, on a radio show in Kassumay FM 107.0 to raise awareness in Ziguinchor region about the importance of reforestation of the mangrove. In Senegal, Mamadou Lamine Coly, a Forestry and Environment Engineer, has been serving as a UN Volunteer for UNDP since December 2017. He is involved in several environmental information and outreach activities to protect the environment, including contributing to the reforestation of mangroves in the south of the country. 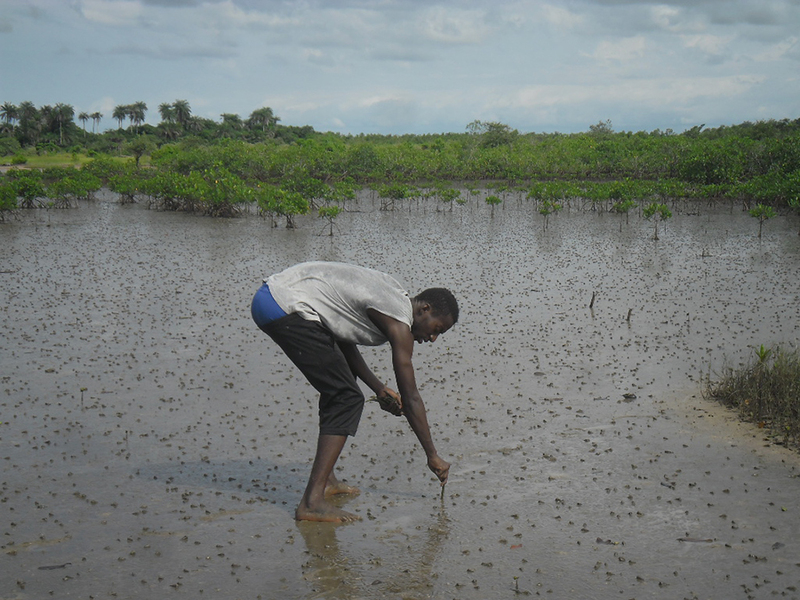 As part of the Management of Mangroves Ecosystems, several tens of hectares in Sédhiou (08 villages) and Ziguinchor (04 villages) were replanted in 2017, facilitating the return of fish and biodiversity. In his view, it is important to promote resilient land management practices and build the capacity of people to respond to the challenges of climate change.